Your day-by-day itinerary now includes Catedral de Montevideo. Kick off your visit on the 9th (Mon): take in the spiritual surroundings of Catedral de Montevideo, admire the masterpieces at Museo Municipal de Bellas Artes Juan Manuel Blanes, take a stroll through Ciudad Vieja, have fun and explore at Museo Gurvich, then contemplate in the serene atmosphere at Catedral de Montevideo, and finally wander the streets of Pocitos. For maps, traveler tips, reviews, and other tourist information, go to the Montevideo trip itinerary maker site . Santana do Livramento, Brazil to Montevideo is an approximately 6.5-hour car ride. You can also fly. December in Montevideo sees daily highs of 32°C and lows of 19°C at night. Finish your sightseeing early on the 9th (Mon) so you can take a bus to Punta del Este. To find where to stay, photos, traveler tips, and more tourist information, read Punta del Este trip planner. Traveling by bus from Montevideo to Punta del Este takes 2 hours. Alternatively, you can drive. When traveling from Montevideo in December, plan for little chillier days and about the same nights in Punta del Este: temperatures range from 28°C by day to 21°C at night. You will leave for Colonia del Sacramento on the 10th (Tue). Kick off your visit on the 10th (Tue): don't miss a visit to La Calle de los Suspiros, get engrossed in the history at Museo Portugues, and then take a stroll through Barrio Historico. To find photos, traveler tips, other places to visit, and other tourist information, you can read our Colonia del Sacramento sightseeing planner. You can drive from Punta del Este to Colonia del Sacramento in 4.5 hours. Alternatively, you can take a bus. While traveling from Punta del Este, expect somewhat warmer days and about the same nights in Colonia del Sacramento, ranging from highs of 32°C to lows of 22°C. Wrap up your sightseeing on the 10th (Tue) early enough to ride a ferry to Buenos Aires. 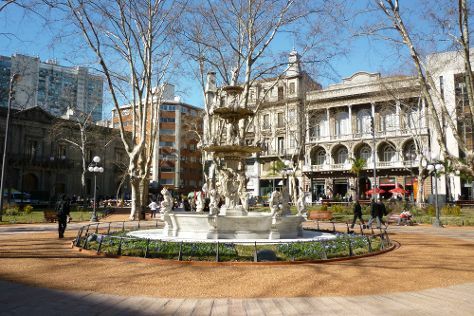 Kick off your visit on the 10th (Tue): admire the architecture and history at Plaza de Mayo. Get ready for a full day of sightseeing on the 11th (Wed): take a stroll through San Telmo, stop by La casa del dulce de leche PLAZA DORREGO, then take in nature's colorful creations at Parque 3 de Febrero, and finally admire the masterpieces at Museum of Latin American Art of Buenos Aires. To see ratings, traveler tips, photos, and other tourist information, read our Buenos Aires trip planning site . Getting from Colonia del Sacramento to Buenos Aires by ferry takes about an hour. Other options: take a bus. In December, daily temperatures in Buenos Aires can reach 33°C, while at night they dip to 23°C. Wrap up your sightseeing on the 13th (Fri) to allow time to drive to Tigre. Teeming with weekend visitors and day-trippers from the national capital, Tigre and its lush nature offer a range of opportunities for exploring the great outdoors. To see traveler tips, other places to visit, ratings, and tourist information, use the Tigre trip itinerary builder app . Tigre is just a short distance from Buenos Aires. In December, daytime highs in Tigre are 34°C, while nighttime lows are 21°C. On the 13th (Fri), wrap the sightseeing up by early afternoon so you can travel to Sao Paulo.